Four San Diegans have scooped a prestigious Gold Quill award this year. Congratulations to Christina Barilla, Mike Godfrey, ABC and Denise Tanguay from Scripps Health, and Steve Hubert from the San Diego County Water Authority. 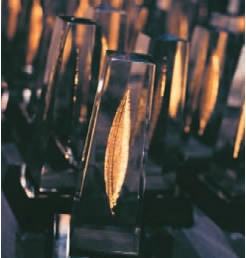 The global awards competition recognizes outstanding achievement in communications. Entries comprise two parts: the work plan and the work sample. Judges are IABC members. Christina and Mike,were recognized with an award of merit in the category of Electronic and Digital Communication Skills. Their win is for the “2009 Scripps Health Annual Report” and marks Mike’s fourth consecutive Gold Quill for this publication. The awards will be presented at the upcoming IABC World Conference right here in San Diego.